Contact Our customer Service for Exchange Options. Exchanges are free! 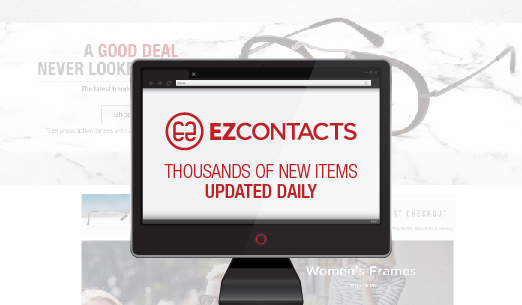 If you want to return an item for a different size, color, or frame, EzContacts.com will gladly do it, and for free. Shipping charges may apply. Just follow these 3 simple steps to have your item EXCHANGED. Call or email us to acquire a Return Merchandise Authorization (RMA) number. Complete return form sent to you. Please fill out clearly what you are returning and what you are exchanging it for. Send it along with your package. Ship it back to us in a box, not in any kind of envelope. Please allow 48-72 hours from when items are received for us to ship out the item of exchange and to process any price differences. Just follow these 3 simple steps to have your item RETURNED. Complete return form sent to you. Please fill out clearly what you are returning and the reason of return. Send it along with your package. The amount to be refunded for items that are returned will not include shipping charges. Please allow 48-72 hours from when items are received for us to process the refund. Closed and Unmarked. EZContacts.com will accept returns on all closed and unmarked contact lens boxes that are 2 year prior expiration date. Unacceptable returns will be subject to a fee shipping it back to the customer. Exchanges are Free! Just call us for a Return form and RMA number before shipping it back. Shipping charges may apply. How to Return: Please Follow Steps 1-3 Above. Please allow 48-72 hours from when items are received for us to process the refund. The amount to be refunded will be the cost of the item minus any coupons used and will not include shipping charges. All contact lens refunds are subject to $3.00 Restocking fee per contact lens box. EZContacts.com is not responsible for packages lost in transit.